How to Cook your Food? When to Cook your Food? Which Utensils we should use to Cook our Food? I think these days we, don’t care all these questions, which are written at the beginning of this Article? Even I myself was having no knowledge before 7-8 years. I learned to do Yoga and Vipassana Meditation, got many Health Benefits. But never made any improvements in my Diet Plan. Despite of doing Daily Yoga and Meditation, I was facing some Health Problems, especially Headaches, legs Pains, Feet Pain. Make myself Busy all the time with Cooking, Cleaning, Decorating and Blogging Business- Ease Bedding and Shop for Saving. Because to live Healthy Physically and Mentally, we have to change our Daily Routine by doing some Yoga, Meditation, Walk, Chanting etc and Eat only Home Cooked Food, not Processed Food. Not only this we have to use Good Quality Cookware. Which Utensils should we Use to Cook? First Choice: Clay Cookware is the number one to use to Cook your Food, but it takes a lot of time and efforts to Cook your food, even hard to find these days Clay Cookware. Second Choice: Second option is to use Steel Utensils, which are easy to use and according to Ayurved, they are good to use for Cooking. 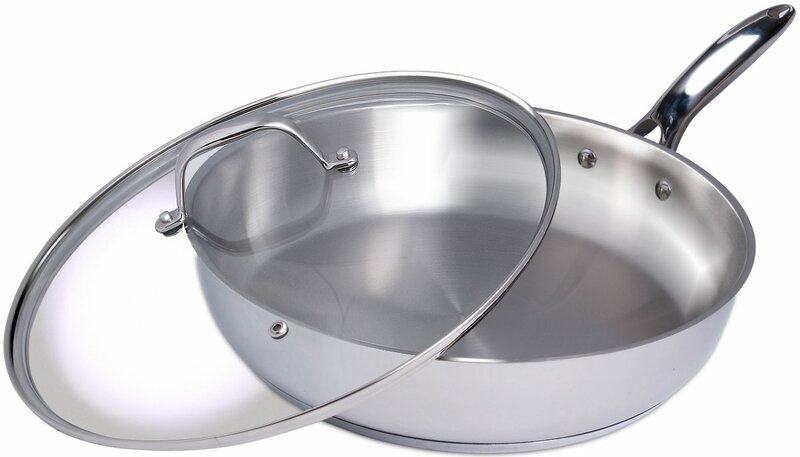 So for example you can Use Steel Stainless Steel Frypan, which are listed Below to choose the Best one according to your Need and all of them have Good Reviews, as well as Good Price. Why Stainless Steel is Second Choice? 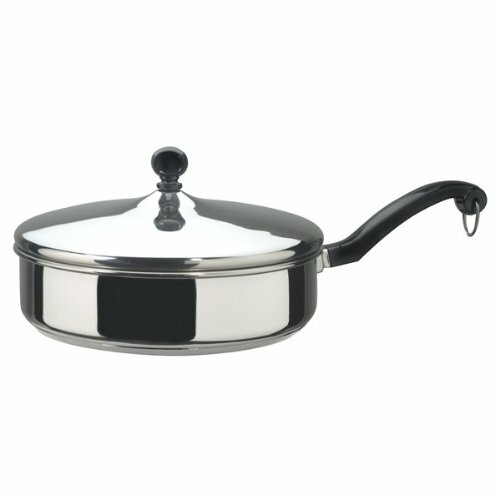 Because Stainless Steel is often considered the Best when it comes Cookware after Clay. Used in Households all over the World any by Professional Chefs. It has so many Benefits, which are listed next to this. The straight sides of this family size fry pan lend room to any Dish. Made of stainless steel with an aluminum core to Heat evenly – you won’t have scorch marks around the inside edge when you’re Frying. Inspired by the great French kitchens, Cuisinart began making professional cookware almost 30 years ago. Constructed of the finest materials available to perfectly perform all of the classic cooking techniques. Cuisinart cookware continues a long tradition of excellence. Unique triple-ply construction joins a brushed stainless steel exterior, a pure aluminum core that provides even heat distribution, and a stainless steel interior, for optimal performance. Heat Surround technology maintains even heat distribution along the bottom and side walls of the Cookware, eliminating hotspots. Multilayer cookware frying pan is among the best in the World and is rated to be one of the best cookware brands available today. Good Material: Each pan is made from a stainless steel 18/10 Interior with an aluminum core and magnetic stainless steel exterior. 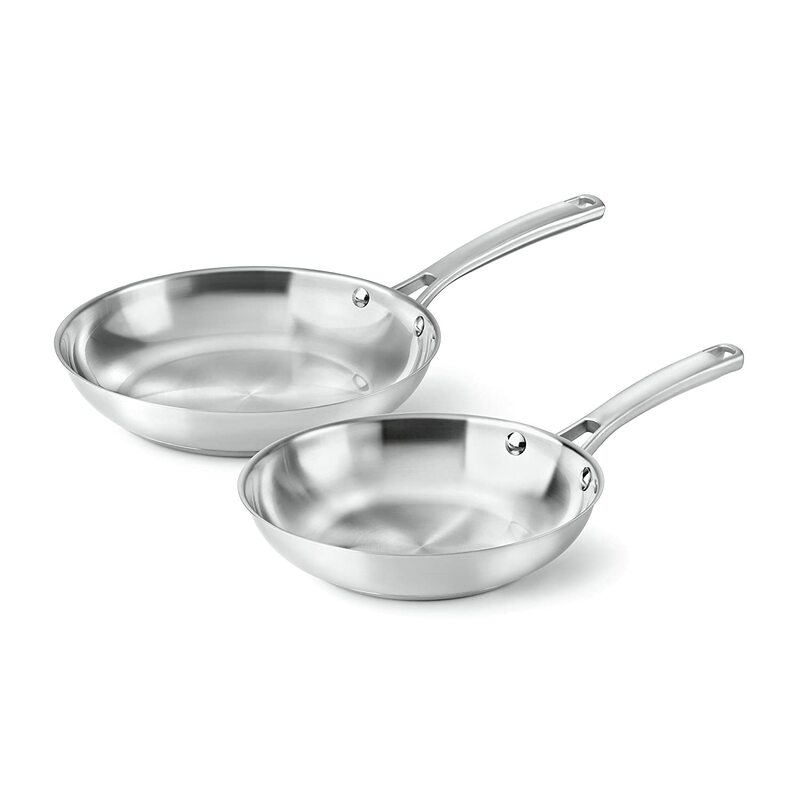 Each pan has an integrated proportion system for even heat distribution and an easy-pour rim. See below for more details. Ready to Uses and Easy to Clean: Equipped with an ergonomic hollow and heat-insulated stainless steel handle, ELO’s Multilayer frying pan is ready to be used on electric, gas, induction and glass ceramic stoves along with being oven safe with heat resistance up to 240 Celsius and 464 Fahrenheit. Dishwasher safe. Stainless Steel is a non-reactive material and will not alter the look or edibility of food. High performance 304 material resists rust and prevents corrosion. 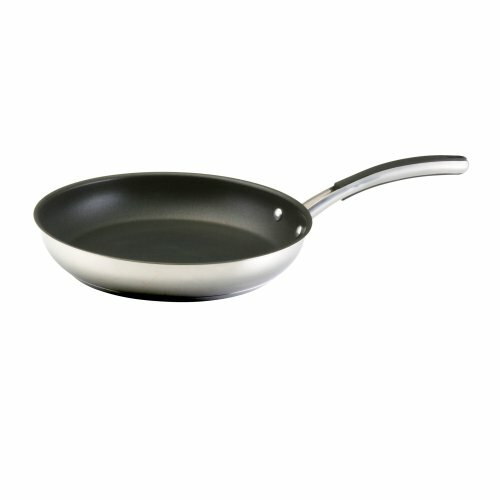 Ceramic non-stick frypan is free of PTFE & PFOA chemicals. Solid stainless steel handles are ergonomically Designed for Comfort grip. Side handles are securely riveted to the base and positioned higher to prevent overheating. The skillet is dishwasher Safe for easy cleaning, and oven-safe to 500 degree Fahrenheit. An 18/0 stainless protector surrounds the thick aluminum base, providing perfect heat distribution across the bottom of the pan and suitability for induction stovetops. Safe for all cooking methods including induction. 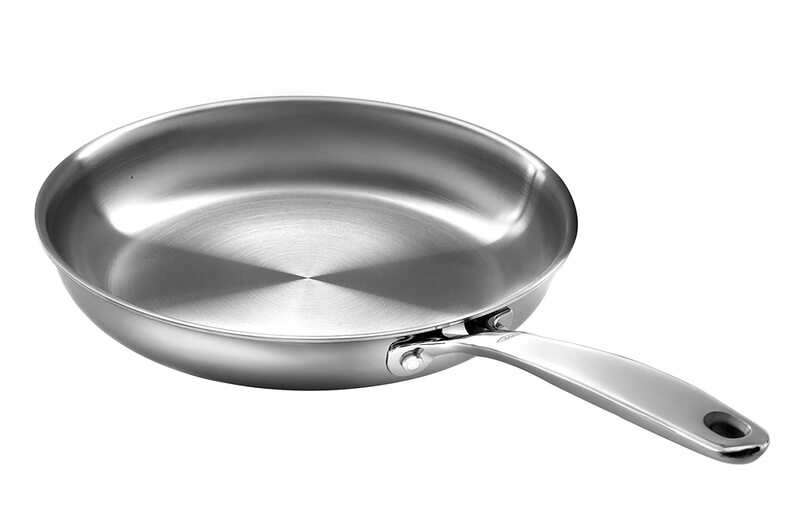 This essential Circulon Genesis Stainless Steel Nonstick 8-1/2-Inch French Skillet is a must-have in the contemporary kitchen. 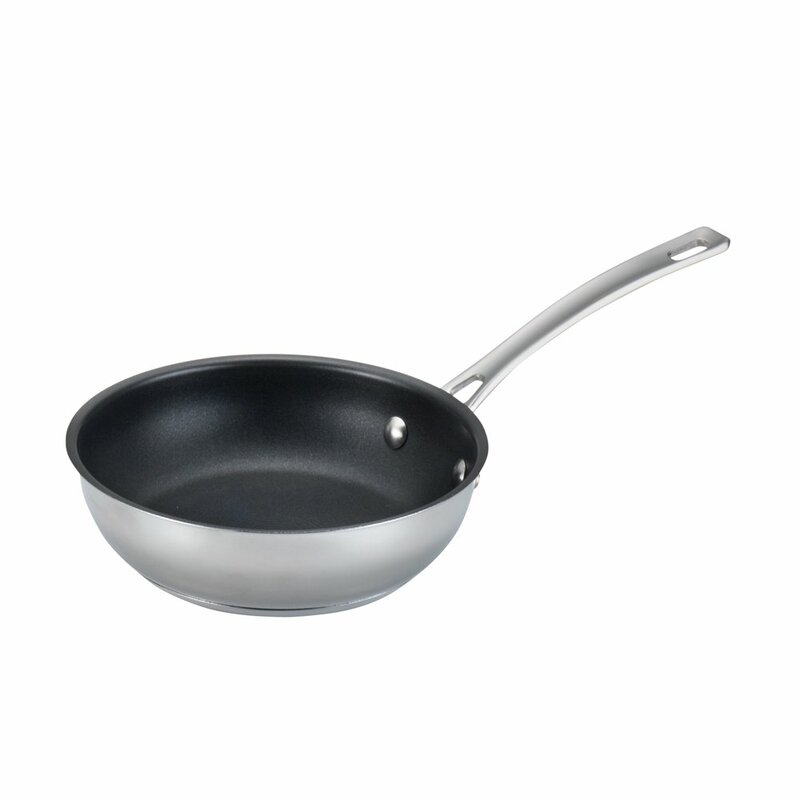 The skillet combines the healthy benefits of nonstick cooking with the classic style of stainless steel. An impact-bonded aluminum base provides even, quick heating and is suitable for all stovetops, including induction. The chic, contemporary polished stainless steel exterior offers stove-to-oven-to-table performance and is easy to clean. Enjoy using the skillet at dinnertime to saute a side dish of cooked broccolini with pine nuts and garlic or to sear a spice-rubbed rib-eye steak. The stainless steel handles are solidly double riveted for strength. This skillet, along with all Circulon Genesis Stainless Steel Cookware, is dishwasher safe and oven safe to 500 Degree F. Reach for the essential Circulon Genesis Stainless Steel Nonstick 8-1/2-Inch Skillet again and again to help create nutritious meals, morning, noon and night. Features of the MSR Alpine Fry Pan Heat-spreading aluminum disc welded to the bottom An efficient and even heat that will keep your meal options wide open Superior Performance: Stainless steel with aluminum bottom disc for superior efficiency and heat distribution Compact: Folding/removable handle; nests inside Alpine 3L Pot. No Grease Anymore: You can now cook with safety with Bonetti’s splatter screen, and be sure that no oils, water or food will paint your kitchen walls. Everything will stay neatly inside their container, and your kitchen will remain as clean as before you started cooking! Silicone Handles to Protect your Hands: We enhanced the quality of our product, by putting silicone on the handle, so your hands won’t get burned. Now you can safely touch the splatter screen without having to wear protective gloves. 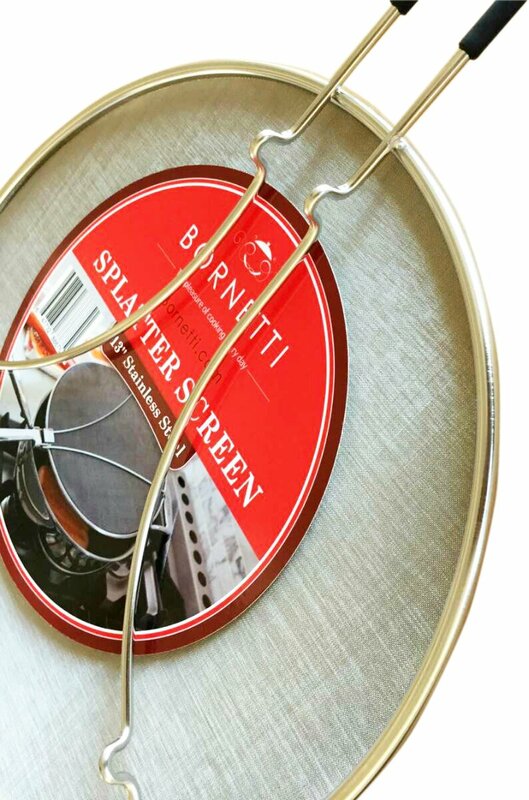 Stainless Steel and Universal Size: The Burnetii splatter screen is made of stainless steel to last you a lifetime! Its thick mesh cover provides extra safety for your kitchen so you can enjoy the pleasure of cooking without fear of hot splashes on your skin. It comes in 13”, a large universal size, to fit all your pots and pans-even the smaller ones! It’s ECO-Friendly, and comes with CIQ and SGS Certifications! Counter will not Get Dirty: We’ve added resting feet on our screen, so when you’re checking your food, the grease of the pan won’t mess your counter! They’re perfectly balanced and stay above the surface of the counter for higher stability. One of the most used pans in any well-equipped Kitchen, this versatile skillet is ideal for Cooking omelets, pancakes and quesadillas, as well as Saute Panning vegetables. 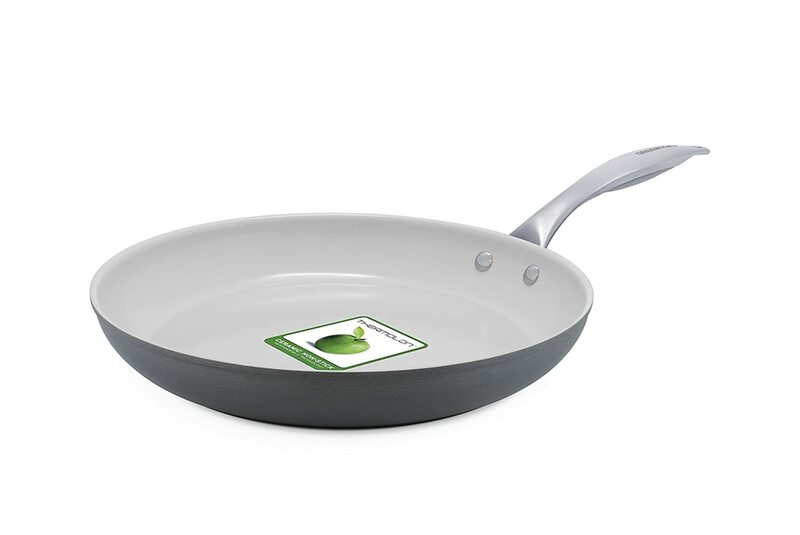 The GreenLife Classic Gourmet Pro Ceramic Non-Stick Open Frypan is not only Durable, but convenient also!! The professional quality hard anodized body has excellent heat conduction and a sturdy base. 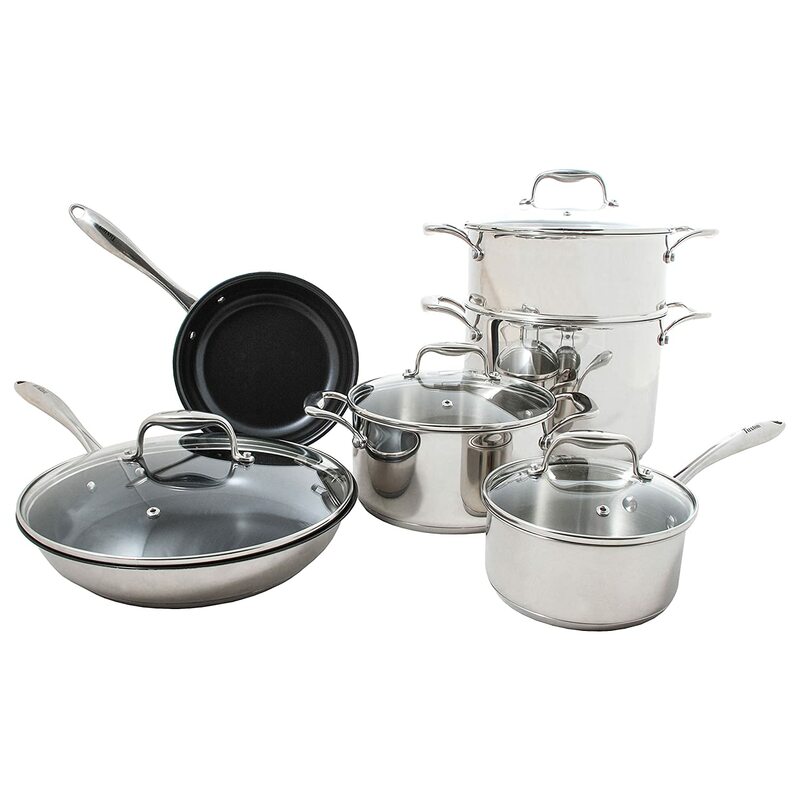 The ergonomic stainless steel handle with a non-slip silicone insert helps this cookware set become oven safe. Thermolon is manufactured without PFAS and PFOA, does not contain any lead or cadmium and allows for less fats and oils to be used. It gives you ideal frying results with lower heat settings. The matte dishwasher safe coating gives this open frypan added convenience. Cook without Oil, Butter and Grease! Are you tired of scraping, scrubbing, and all those scratches? It’s lightweight yet super strong. It won’t scratch, chip, or peel into your food. It’s PFOA and PTFE free, so it’s safe for you and your family. 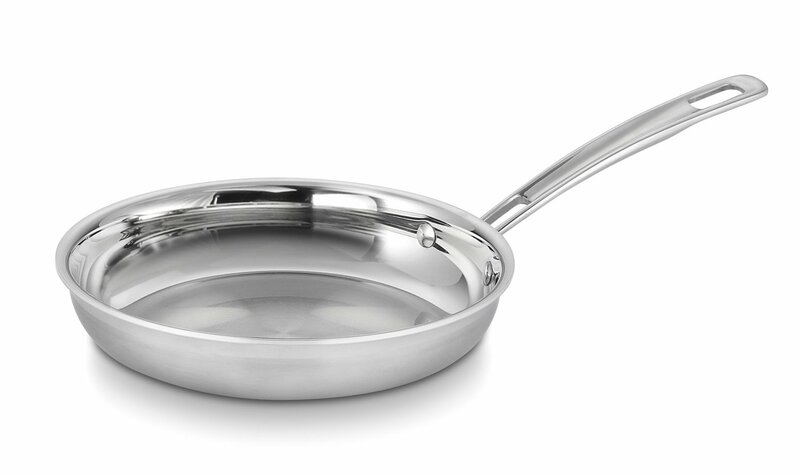 You can use this 10″ fry pan for anything – flambé desserts, broil flakey fish, or bake chicken parmesan. 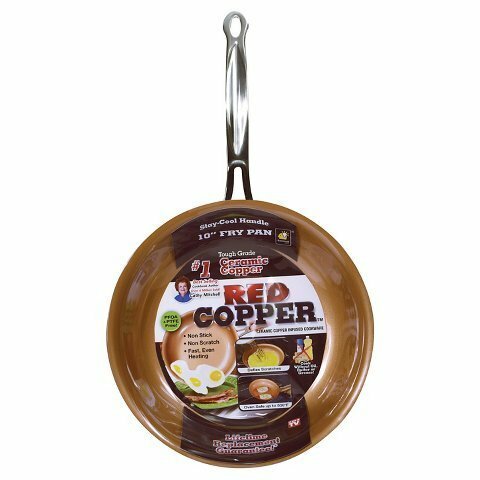 Red Copper is the most versatile pan you’ve ever used. Plus, it’s even dishwasher safe!